Though I love checking out all of the tourist attractions around a new location, I also love checking out the more simple and free things to do as well. So when visiting Washington I decided to dig around on google a bit until I gathered a list of free things to do in the Seattle area for kids. We decided to split them up into a couple of days so we could have time to explore everything thoroughly and it was a blast. Though there are probably a ton more activities we could have done, our time was limited as we had other destinations to conquer. So here are my top 8 free things to do in the Seattle area for kids that they won’t find boring or dull. I have personally never been to a bug museum before so when I found this little gem I was pretty excited! I mean…my boys were really excited. The Bug Museum & Reptile Room is a small little building just off the highway with loads of neat bugs inside. Let me just say, I have been to many zoos and this museum had so many bugs and insectsPIN IT! that I had never seen before in my life. The Reptile Room though small was filled with snakes that I have never encountered in a zoo before such as corn snakes and king snakes. Common snakes in some areas but still neat to see up close and personal. We also picked up a scavenger hunt activity sheet for my oldest to complete while we read up on all of the different animals. Once we drew our favorite bugs on the chalk board, we picked up a couple of souvenirs and donated a couple of dollars for offering an awesome free experience. 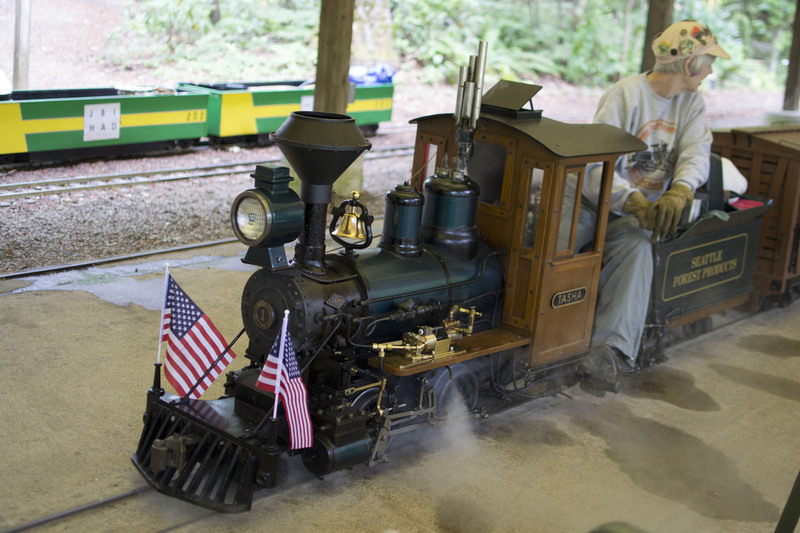 Okay, think of full size trains, the steam propelled ones and the more modern Amtrek ones, now shrink them down to a small child’s size and that’s what you have at the Kitsap Live Steamers. When we walked up and saw the trains I became immediately excited to hop aboard! I felt like a little kid and could barely contain my excitement for a ride on the little trainPIN IT!. Since there are no age restrictions my 1 year old was able to hop on board with me and hang on for the 5-7 minute ride which went over bridges and all through the forest. This attraction only runs twice a month so be sure to check out their site and plan accordingly. My oldest absolute loves the Hobbit as well as the Lord of the Rings so when I found out there was a Hobbit House nearby I knew we would have to add it to our list. The Hobbit House is located inside the Brother’s Greenhouse which is one of the best greenhouses I have ever visited. They had so many plants and flowers to fairy houses and a whole Shire town. The Hobbit House itself is beautifully set up and even has a wooden bench and fireplace inside. I also found out that clearly I’m as short as a hobbit since I could stand upright with no problems inside. As the fairy tale goes, there’s always a troll living under a bridge and in Seattle, this still stands true. The Fremont TrollPIN IT! 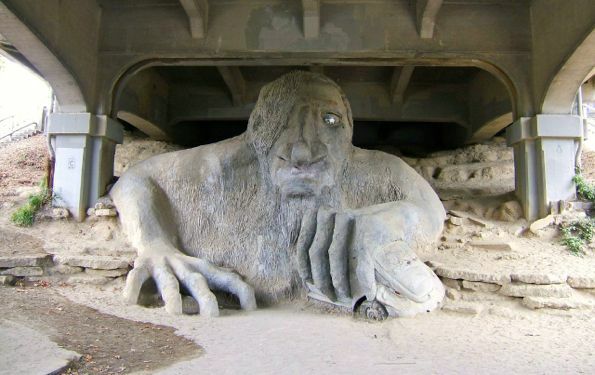 is a giant troll located under a bridge that is an awesome sight to see with littles. The troll is decorated from time to time and sadly people feel the need to destroy it with graffiti etc. however that doesn’t take away from the majestic size and sight of him. 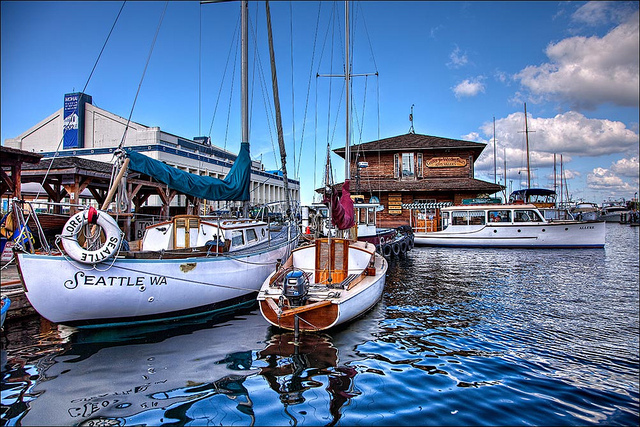 Continuing a 25 year tradition, volunteer skippers take passengers out on Lake Union for a free cruise every Sunday at The Center for Wooden BoatsPIN IT!. Sign ups are in person every Sunday starting at 10am so if you want to secure your limited spot then its best to show up early! PIN IT!As the centerpiece of the broad open space and lawn, The International Fountain has been transformed into a water wonderland for the young and old. Children can play in the fountain bowl and venture right up to the smooth silver dome that spouts triple treated recycled water, making it possibly the cleanest water in the city. 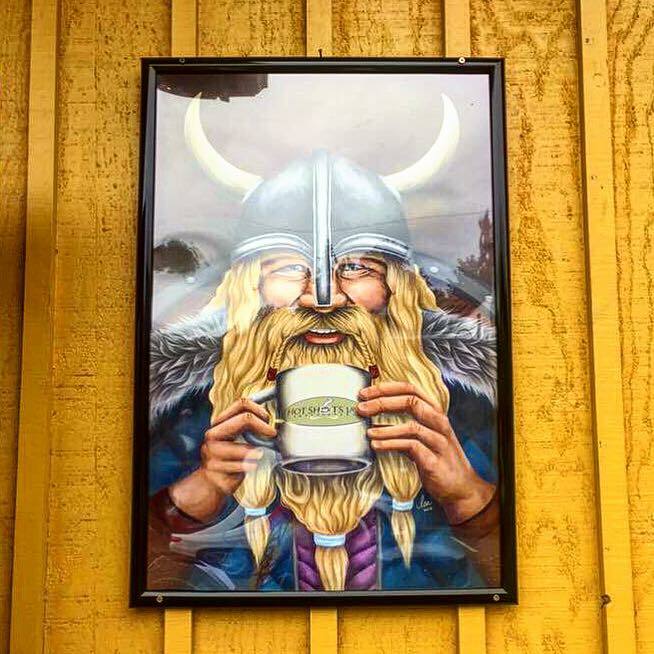 This viking ridden town is full of adventure for little ones to explore. In the month of July they held a “Where’s Waldo” exploration for kiddos to find and earn a prize while giving you the opportunity to chomp down on a local doughnut and admire all of the local art murals around town. There’s even a couple of free museumsPIN IT! that you can check out when your littles have grown tired of the shops. From throwing fish to adding your gum to walls in the city, Pike Place MarketPIN IT! has something to offer everyone. There’s no fee to walk around the market but you’ll want to bring some cash to spend on some local artistry or freshly grown flowers. Don’t forget to grab a cup of mac-n-cheese from Beechers too, you won’t regret it! What fun ideas! I’ve always wanted to go to Seattle. Planning to be in Seattle this December. And will definitely visit these olaces. Seattle is definitely on my travel bucket list. I’d love to visit the Hobbit House someday. I love botanical gardens and things of that nature so I’d sure I’d have a blast there. It would be nice to see the huge freemont troll display. I would love to listen to the story of the structure too. It would be fun to try the trains too. What some amazing sounding things to do in Seattle. I would love to visit the public market myself. Throwing fish?! I need to see that. My friend was recently in Seattle for the first time and she absolutely loved the visit. She brought me a mug from the first Starbucks. I’ve always wanted to visit and it’s exciting to see how many free things for the kids to do. Those look like fun places. I don’t know that I would want to visit that troll though. He looks super scary. We love Seattle and are planning on visiting with my granddaughter when she’s older. We can’t wait to take her to Pike Place Public Market! Looks and sounds like a fun family place. I have never been there. I bet my girls would really enjoy it. I have always wanted to go and visit Seattle!! This looks like a great list of things to take the kids to do while in the area! Seattle is so cool! This is such a great list of fun things to do! I am always looking for new activities to get out with the family and not spend a fortune. These are great suggestions, Paulsbo definitely sounds like an awesome place to check out! Oh fun! The fountain would be a great hit for my kids. They could spend all day being in the water like that The troll would be cool to see too. I took my kids to Seattle last year and they had a great time! We visited the Pike Market, so awesome! What a great list of free things to do. I hadn’t realized there was a Hobbit House in Seattle, will definitely have to pay it a visit the next time I’m in town. LOVE Beechers mac-n-cheese! It’s the best! What a great variety of activities and things to do with young ones. My niece is enrolling in a wooded boat building school in the Seattle area right now, very interesting craft. Free is always great especially for things to do with kiddos. These all sound fun. I would love to see that troll in person lol. This is a great list for kids and adults. I would love to visit Seattle one day. I have got to see the troll, too cool. I don’t mind paying for experience but it’s also nice to be able to go to places for free! This is a pretty awesome list! I’ve been thinking about going to Seattle with the kids.